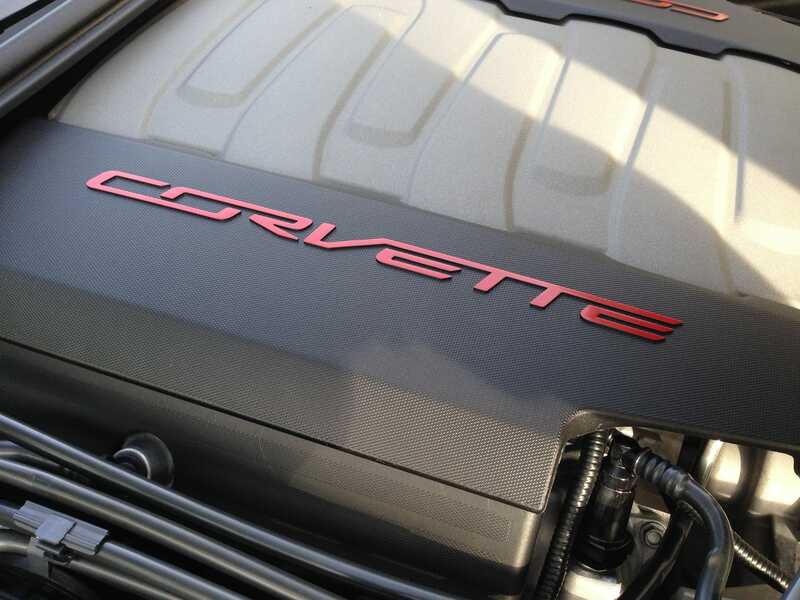 The Corvette and the Ford Mustang don’t make for a pure head-to-head matchup, but they do have similar V8 engine specs. The Corvette is the more aggressive-looking of the pair – and it costs more. In the end, though, the MustangGT is hard to argue with. Comparing the Corvette and the Ford Mustang isn’t exactly fair. The Mustang GT should go up against the Chevy Camaro SS. But the only Camaro we’ve tested came without the Super Sportiness – there was a perfectly fine turbocharged four-banger under the hood. 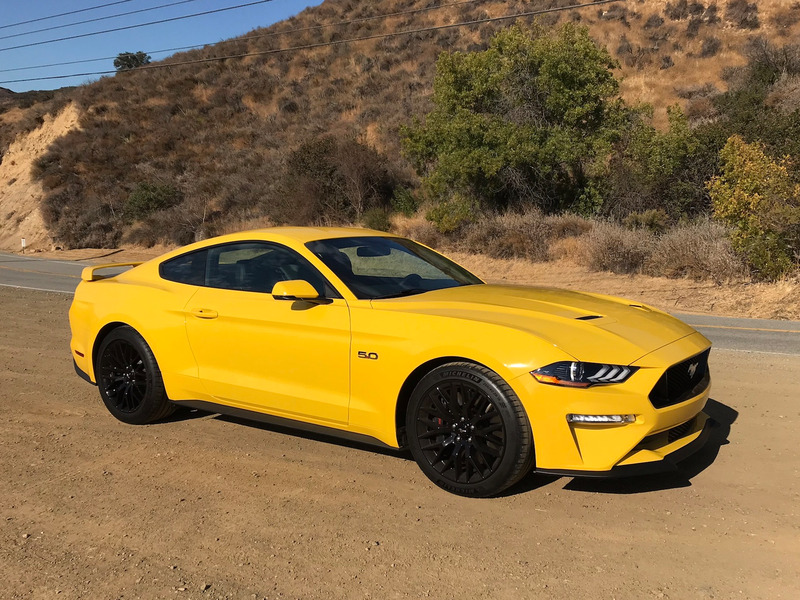 So I decided to make this more of an engine-on-engine contest, which led me from the 460-horsepower 5.0-litre Mustang V8 to the 460-horsepower 4.6-litre V8 under the hood of the redoubtable Corvette Grand Sport. 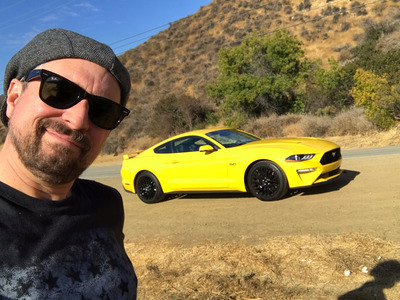 From this pugnacious premise, I figured I could explore which of my two most favourite American sports cars offered the best experience, taking into account that my ‘Stang came with a six-speed manual while the GS had an eight-speed automatic, and also that the Mustang was a hardtop while the ‘Vette was a convertible. 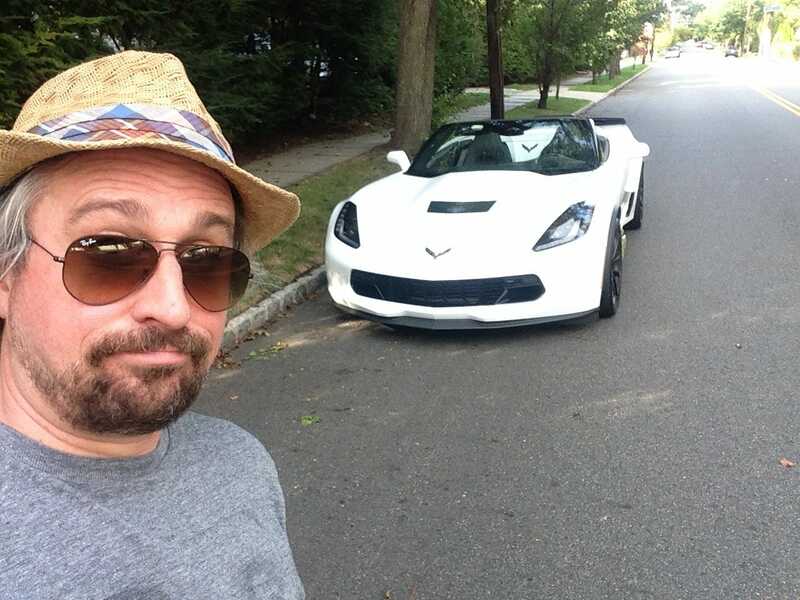 No matter, really, as I’ve driven automatic ‘Stangs with drop-tops and sampled the available seven-speed stick in hard-top ‘Vette. 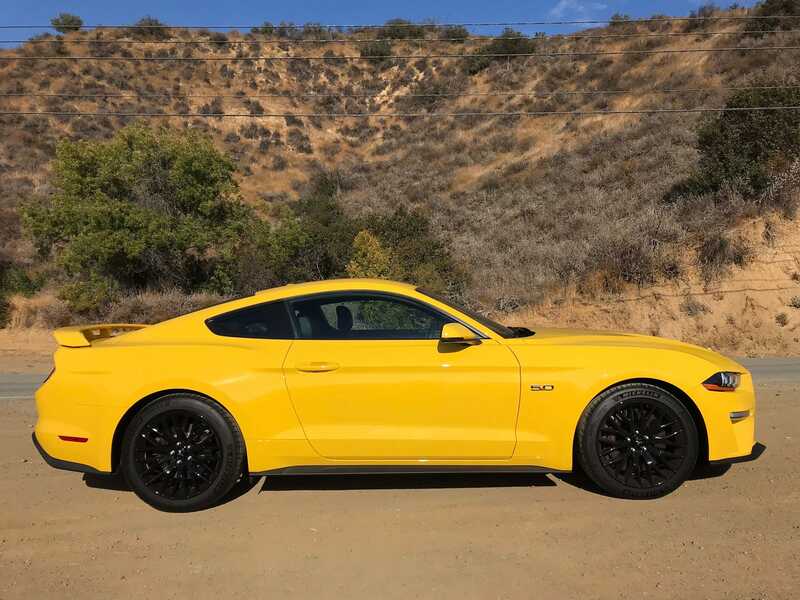 The weather was quite similar: late autumn in Los Angeles for the Mustang, summer in New Jersey for the ‘Vette. I didn’t have to worry about cold ties or slick roads. Read on to discover the victor in this battle of classic American sports-car nameplates. First up, the spectacular new Mustang GT. The Mustang, which has been in the Ford lineup since 1965, is in its sixth generation. I have traditionally been deeply impressed with ‘Stangs. 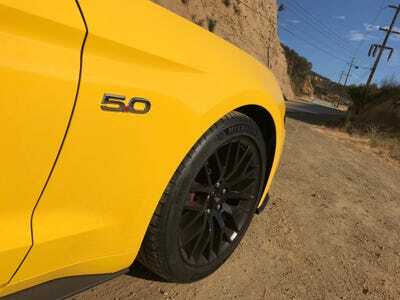 The updated 2018, in fastback 5.0 trim, was no exception. “Obviously, this is a Mustang, so it can haul in a straight line,” I wrote in my review last year. The Mustang looked good in the Southern California sun. The overall effect is to continue presenting the ‘Stang, after more than five decades, as a sports car with global appeal, versus a stonking old American muscle car. The colour was “triple yellow,” and yes, it was very, very yellow indeed. Optioned out the wazoo, it came in at about $US50,000 – though our tester wasn’t officially stickered. Let’s get to the good part: that magnificent, naturally aspirated 5.0-litre V8. At 460 horsepower, the power is a bump on the 2017 car, thanks to reengineered fuel-injection technology. And how’s this for Blue Oval cool? The engine is nicknamed “Coyote” and produces 420 pound-feet of torque. 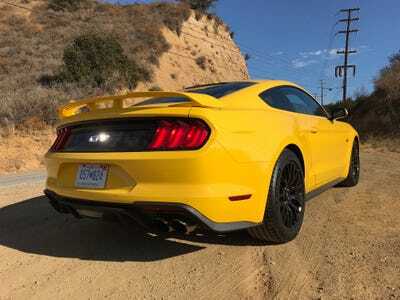 “The real trick with the V8-motored ‘Stangs these days is to deliver German-sports-car-level performance without grinding the backwoods American edge off,” I wrote. 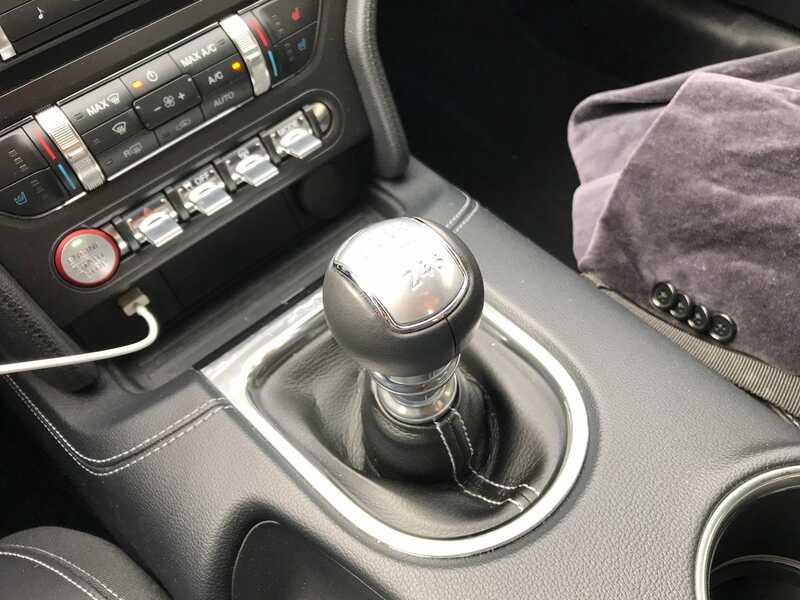 The Mustang GT can be had with either a six-speed manual or a 10-speed automatic. The stick is possibly my favourite on any performance machine these days. 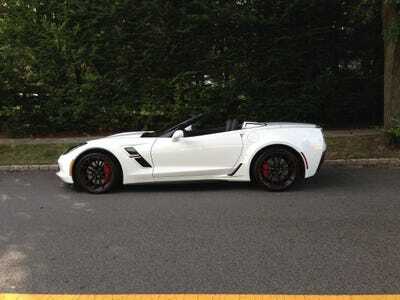 That said, while it gorgeously channels the ‘Stang’s power to the rear wheels, amid the glorious rumble and roar of that V8, it gets some stiff competition from the manual in the ‘Vette – when the ‘Vette is equipped. The 0-60 mph run in the GT is under four seconds. … and so has the back. Trunk space isn’t too bad. There was ample space for my suitcase, and I could have crammed a few more in there. What we have here is an American Grand Touring car – hence the “GT” – but really, all Mustangs are in that general camp. That without a doubt means more practicality than the ‘Vette, which as we’ll soon see barely has room to stash a gym bag. 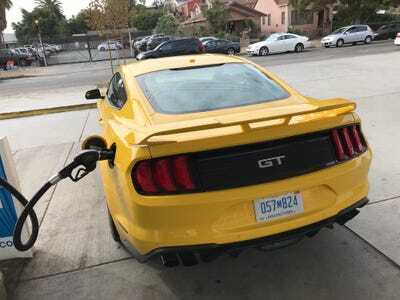 The Mustang GT combines a thirst for premium fuel with a small gas tank. You have to get used to visiting the pump. The MPGs are 16 city/25 highway/19 combined, but the tank can hold only 16 gallons. 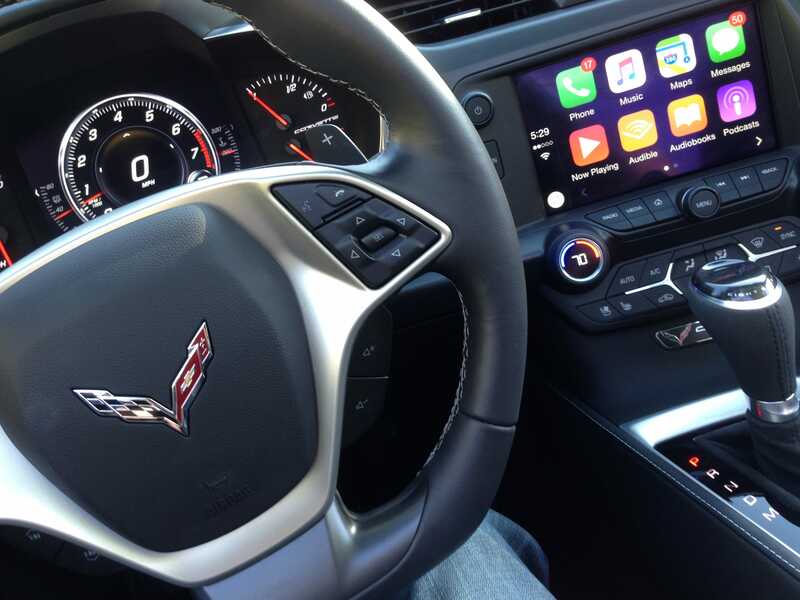 The Sync 3 infotainment system runs on a small screen, but it’s pretty good. 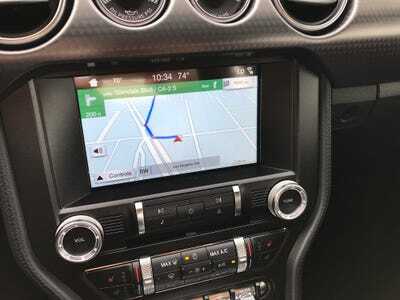 Ford has upgraded Sync over the past few years, and it’s now quite good. 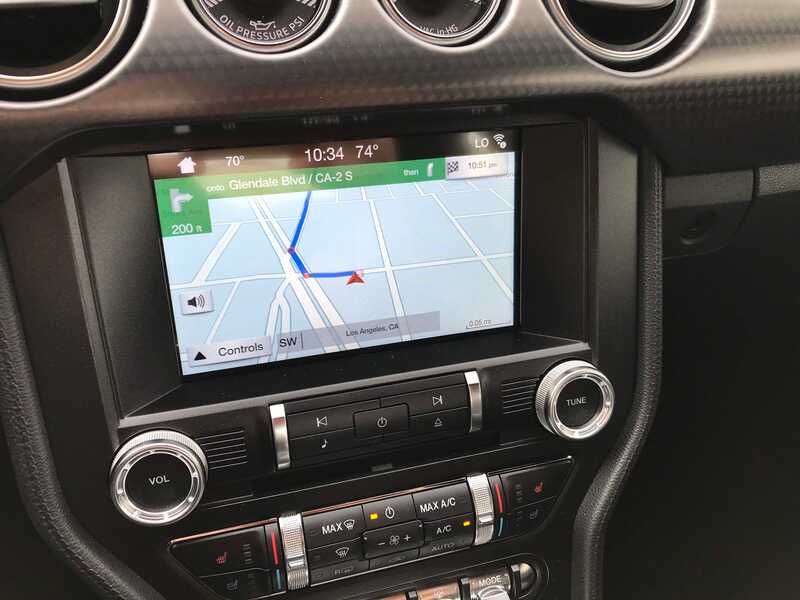 There’s all the usual stuff: navigation, a dandy audio system with Sirius XM, USB/AUX ports, Bluetooth connectivity, and Apple CarPlay and Android Auto. Now on to the monumental Corvette Grand Sport. 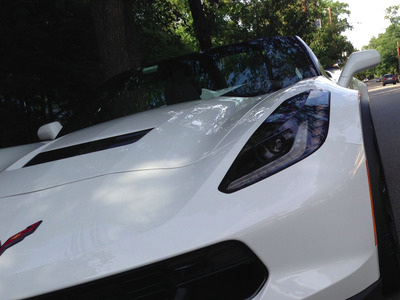 The ‘Vette arrived in 1953 and is now in its seventh generation. 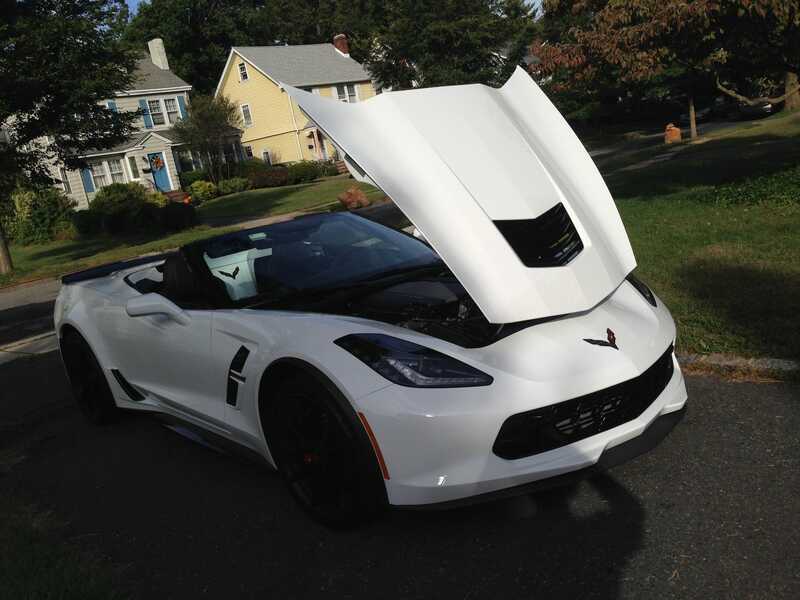 When it came to the arctic-white 2017 Grand Sport I tested, I didn’t hold back. By the way, the original Grand Sport Corvettes were created in 1963 by the car’s first chief engineer, Zora Arkus-Duntov. They were intended to be race cars, designed to run in the 24 Hours of Le Mans race. The ‘Vette GS was much more of a sharklike wedge than the ‘Stang. But the C7-generation ‘Vette has plenty of fans when it comes to the design. Yes, the ‘Vette has but two seats, while the Mustang has, technically, four. But the Mustang’s back seat is, well, not exactly spacious. The tester we borrowed stickered at a well-optioned $US86,000. 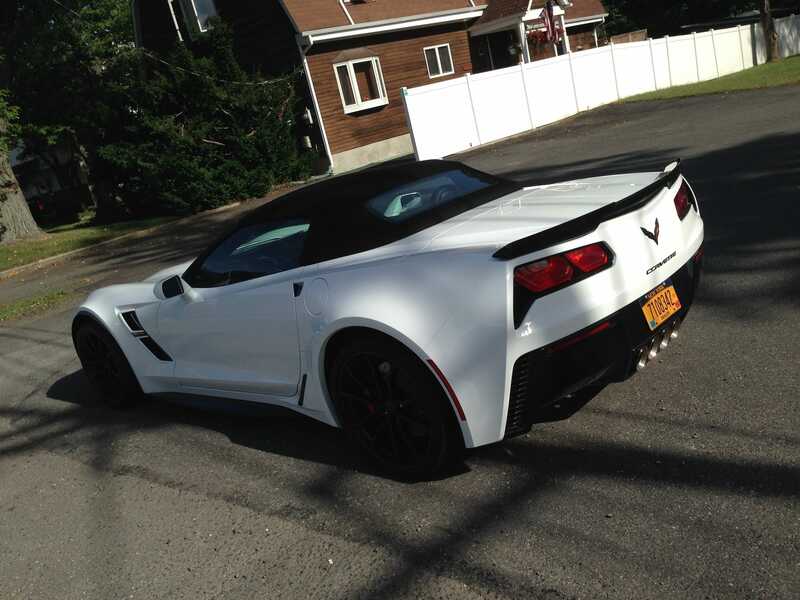 The Grand Sport also packs V8 power. But it comes in a higher-displacement form: the 6.2-litre LT1 eight-pot with 465-pound-feet of torque. The horsepower numbers match the Mustang, but we need a larger-displacement motor to get there. Torque for the ‘Vette is beefier, and you do feel it when you drop the hammer and feel the energy piping to the rear wheels. The eight-speed auto means the GS is fast as heck to 60 mph. How fast? Exactly 3.6 seconds fast. The automatic ‘Vettes are all faster than their manual counterparts. 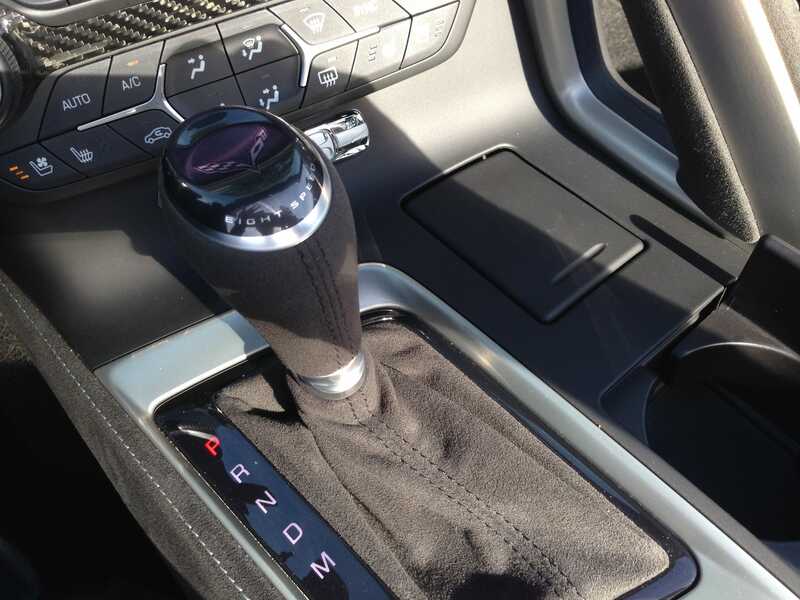 If you want to shift gears yourself, however, you can switch to using paddles behind the steering wheel. With the top down, the ‘Vette GS comes off as menacing fun. But to be sure, the design is considerably more supercar-aggressive than the Mustang’s. This is nothing new. 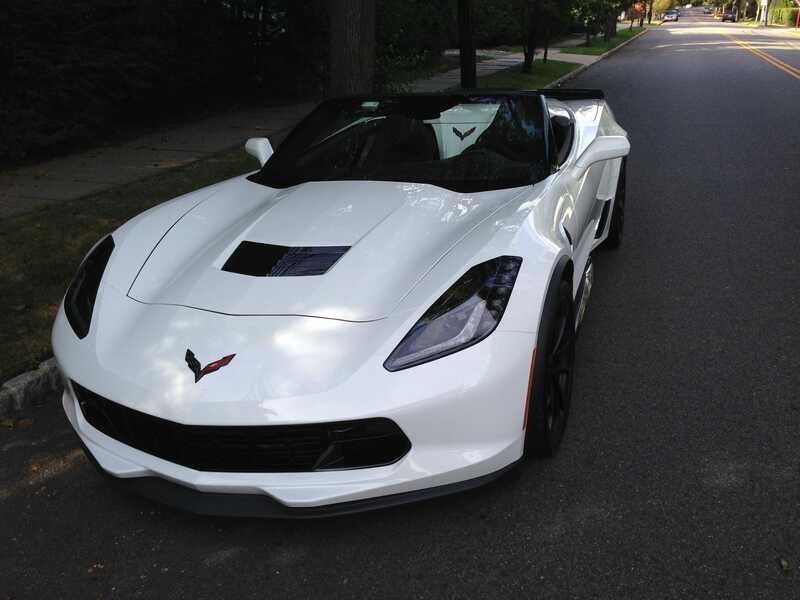 For decades, the ‘Vette has had the Camaro to do direct battle with the Mustang and has been able to pull out the stops on a bold exterior impression. 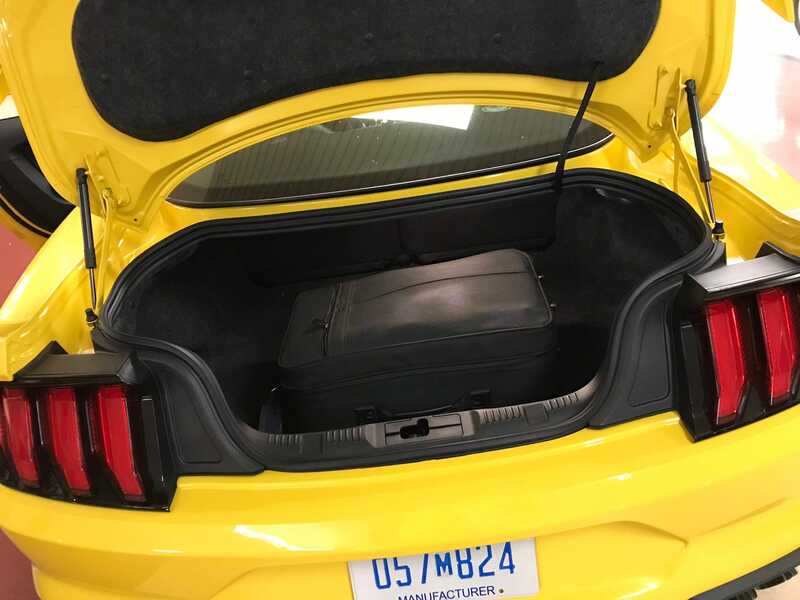 Because the ‘Vette needs space out back to stash the convertible top, there’s very little room for cargo of any sort. On the plus side, the ‘Vette has a pretty cool hood that opens in the opposite direction of what most folks are used to. The Corvette GS has a slightly larger fuel tank than the Mustang GT: about 19 gallons. 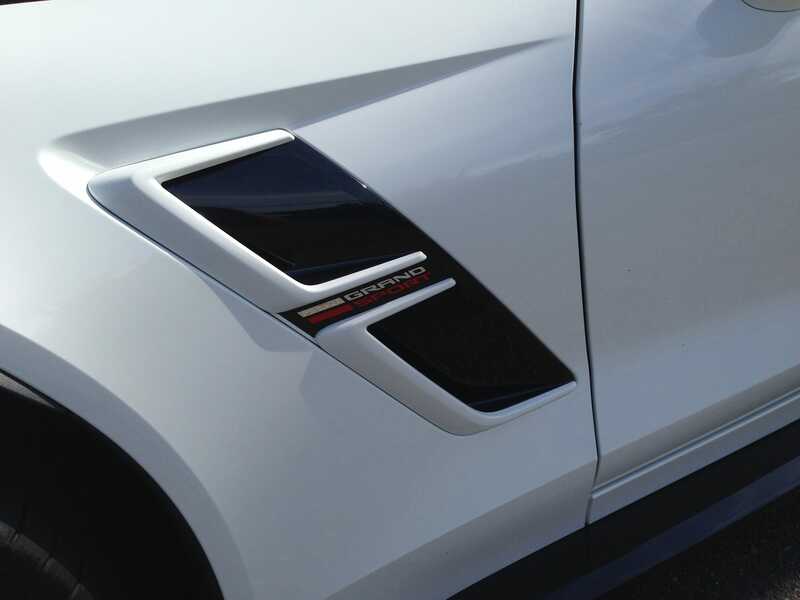 The MPGs for the ‘Vette GS are 16 city/25 highway/19 combined – the same as the Mustang GT. The ‘Vette runs Chevy’s IntelliLink infotainment system. We’re fans of this system. You have CarPlay plus Sirius radio, Bluetooth connectivity, USB ports, navigation – and, of course, 4G LTE wireless connectivity managed through OnStar. As much as I love the Corvette Grand Sport, the winner is the Mustang GT! 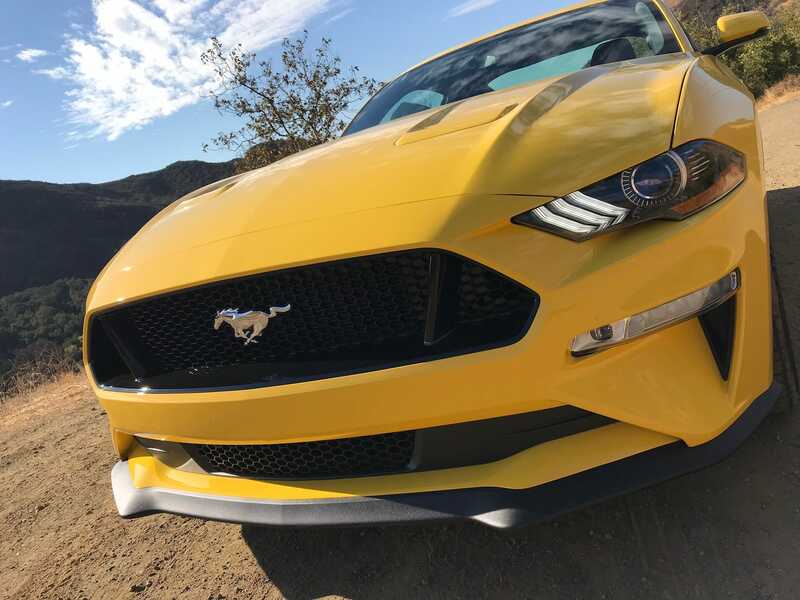 While the ‘Vette offers the best performance for the money of almost any sports car in the world, the Mustang gives you a similarly potent V8, a marvellous driving experience, and far greater versatility. In the battle of a big V8 with no back seat and a microscopic truck versus a big V8 with a teeny back seat and decent-size truck, the latter takes the prize. Also, the Mustang GT is much cheaper. Having driven a bunch of Mustangs and a bunch of Corvettes in the past few years, I can confidently say both machines are as good or better than the best the Europeans have to offer. Corvettes, in particular, deliver Ferrari-Lamborghini-level thrills for a fraction of the price and with true track cred – the race-car version of the current-gen ‘Vette has torn it up in endurance racing against Ferrari, Porsche, Aston Martin, BMW, and even Ford’s mighty GT supercar. But lately, I’ve leaned toward Ford. “Brothers and sisters, if you think a sports car might be for you, just get one of these,” I’ve written of the ‘Stang. The GS is astounding, tempting, and rather wild. But I’d buy the Mustang GT.